New York (April 11th, 2018) – DY Consultants sponsored and attended the ASCE Metropolitan Section’s 21st Annual Air Transport Group Conference at Vaughn College in New York. The conference brings together civil engineering experts and thought leaders within the air transportation industry to exchange ideas, learn about the latest innovations in the field and to network with other experts. The keynote address was given by Charles Everett, Deputy Aviation Director of The Port Authority of NY & NJ. Among the key highlights were speakers from American Airlines, United Airlines, and JetBlue. They presented airline technology updates on customer experience, what the challenges are and what to expect in the future. 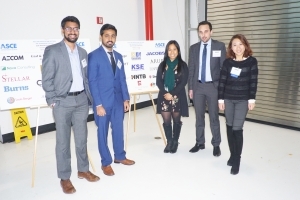 Another highlighted topic was the importance of integrating sustainable design in aviation presented by the Engineering Department of the Port Authority of NY & NJ. The total money raised this year for the ASCE Met Section’s scholarship fund was over $55,000. Not only do DY Consultants look forward to this event for the latest information among civil engineering’s leading experts, but to support upcoming leaders as well!